Deposit (prepayment) could be charged at request. as this is where all the ferries to all of the islands start and return to. When you do, you will find Hostel Goli& Bosi a safe, clean and friendly place to lay your hat and call home. 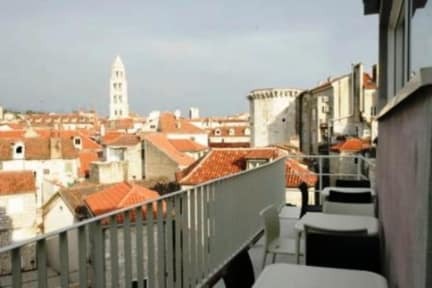 Goli & Bosi is a fresh new boutique Hostel occupying the best location in Split, rock throwing distance from the waterline, within the walls of the old roman city built at the turn of the 4th century. Recently renovated as of February 2016..
As architecture goes, Goli & Bosi is re-using a space of an old 19 century warehouse that in the 20th century got remodeled into a department store, and now, through some inspired cuts and bold design choices earned it's international acclaim. Two out of hostel's three storeys feature bright three and four dorm-style rooms with neat bathrooms, while the top floor offers more luxurious suites with double or single beds, a terrace with a view. All rooms have air conditioning, bedding comes with the beds and there are fresh towels in every bathroom with no additional cost. Common lounge areas are scattered through the hostel, there is a small cinema projection room and a huge sitting space on a square in front of the hostel, great for coffees, meals and meets. Wi - fi internet is freely available throughout the hostel. In itself, Goli & Bosi Hostel is a tourist guide as well, so if the weather is not nice enough for exploration of Split all you have to do is walk around the hostel whose walls will tell you the story of the city. With Hostel Goli&Bosi around the clock check-in options, whenever and wherever you arrive to Split all you have to do is call them in any language you speak and they will tell you how to get to the hostel, even arrange transportation for your convenience.